The three founding partners of eleQtra have worked together on infrastructure transactions in emerging markets since early 2001. As a result, they have been able to build a company that possesses unrivalled experience in the development, financing and structuring of complex infrastructure transactions. 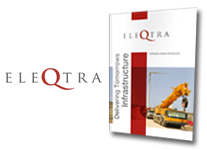 Through its people, eleQtra addresses a significant gap in the market – the lack of experienced development and investment teams to bring infrastructure projects through to development and full financial close. The company was founded in 2005 after the partners had been selected to be the manager of InfraCo Africa, with initial capital provided by the Private Infrastructure Development Group. eleQtra’s first challenge was to assemble a pipeline of viable infrastructure projects for development in a selected number of promising markets. eleQtra quickly grew from a small start up venture with one office, into a company that now has offices in New York, London, Accra, Kampala and Lusaka.